During this past week's art rotation, Kindergarteners were learning all about primary colors, secondary colors, and color mixing! We began by reading the book "Mouse Paint" by Ellen Stoll Walsh to get us thinking about mixing together primary colored paint to create secondary colors. Then we looked at my Kinder Color Mixing PPT and reviewed what we learned about color mixing, and looked at some artwork by famous artists. 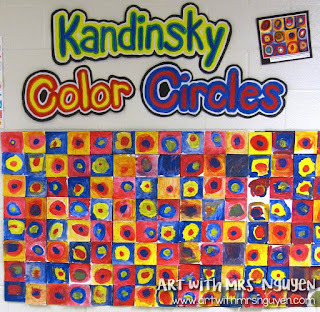 The last image we looked at was Kandinsky's "Squares with Concentric Circles" (1913) and talked about all the colors he used and how he could have made them. Then I sent students back to their seats and gave them a sheet of paper. 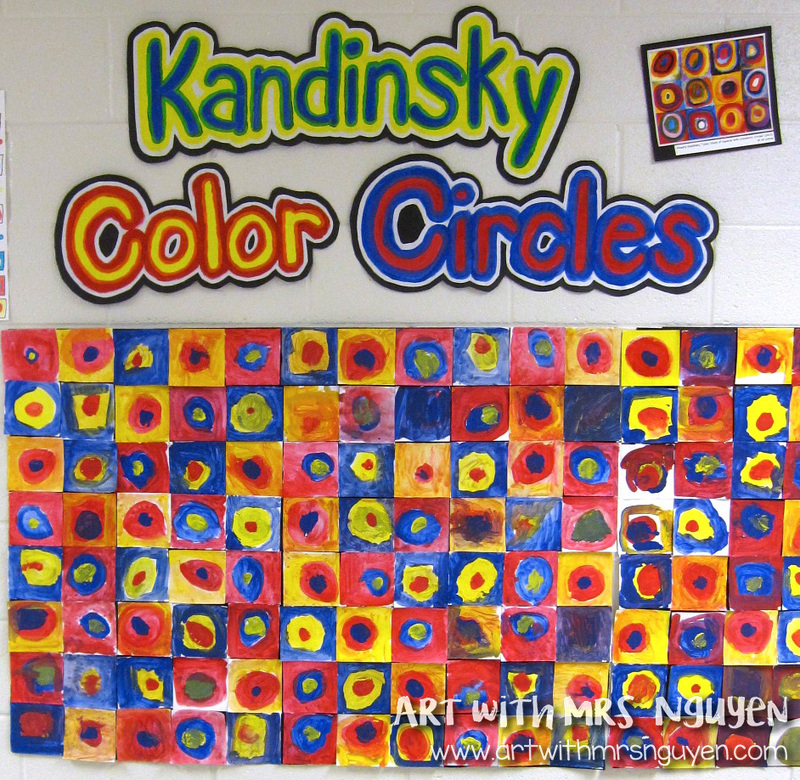 On one side they were to make a drawing with only primary colors and on the back side only secondary colors. The next day we began our painting activity! This particular week in painting is very teacher-directed... and I do that for the following reasons: 1. This is the first time I've painted with tempera paints with Kindergarten this year and I need to be able to see where they are at developmentally. 2. 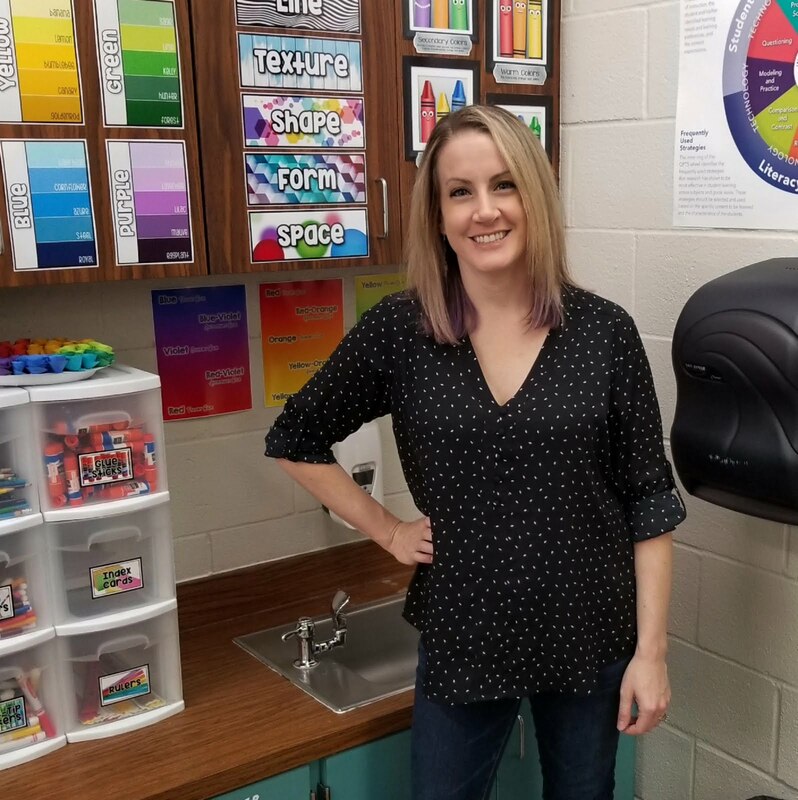 I want to ensure that each student is able to successfully create the secondary colors on their paper so that they can experience that feeling of personal success in their artwork (this will help build up their confidence). So after passing out each student a piece of 6"x18" paper which has been folded into thirds, we begin painting together step-by-step (see image to the right). Next we paint a large blue circle in the next square and add a smaller circle of yellow to the middle - GREEN! Then finally, we paint a large red circle on our last square and add a smaller circle of blue - PURPLE!! The last step is to paint the background color on each square. 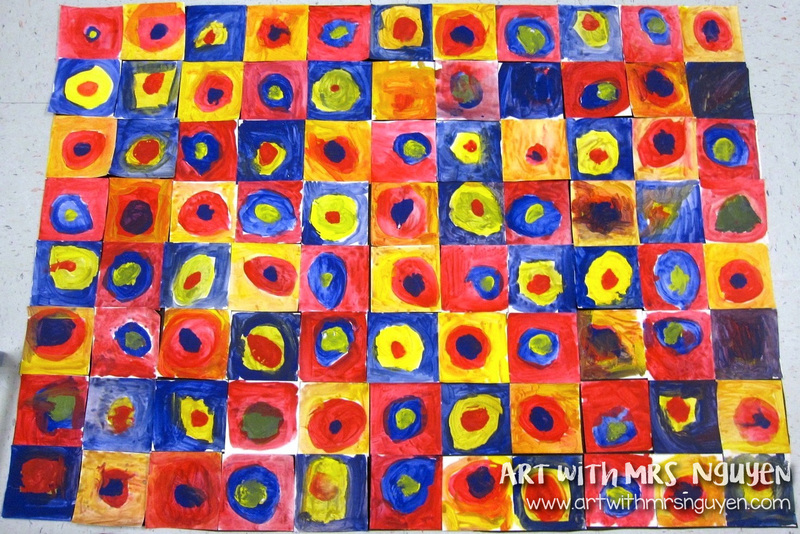 Students are instructed to paint the primary color that they have NOT yet used on that square for the background color. I typically verbally work this out with students. For example, "On our first square we have a large yellow circle with an orange circle in the middle. What color did we have to add to yellow to make that orange circle? (Red!!) Right! So what primary color have we not used yet? (Blue!!)" The kids are amazed at how cool the final piece looks when it is all pieced together.